Habanero (pronounced "ha-ba-NAIR-o") peppers are small, hot, chili peppers that are grown in Mexico and other parts of Latin America as well as in the United States. Habanero peppers are short and squat with thin skin and are usually an orange or red color. Since they are extremely hot, habanero peppers are usually not eaten whole but are widely used in making salsas, sauces, salad dressings and as an ingredient in bottled hot sauce. They're sometimes mistaken for Scotch bonnet peppers, which they resemble and which are equally hot. Habaneros have a slightly fruity flavor which can be enhanced by roasting the peppers. Roasting them also mellows their heat somewhat. Habanero peppers register between 100,000 and 350,000 Scoville heat units on the Scoville Scale. How hot is that? It's difficult to describe, obviously, which is why we need a numerical scale. But it's difficult to comprehend large numbers like 100,000 or 350,000, especially when we're dealing with something as obscure and arbitrary as a "heat unit." Consider that jalapeño peppers, which are fairly middle-of-the-road heat wise, check in at anywhere between 2,500 and 8,000 heat units. This means that habanero peppers can be up to 100 times hotter than jalapeños. 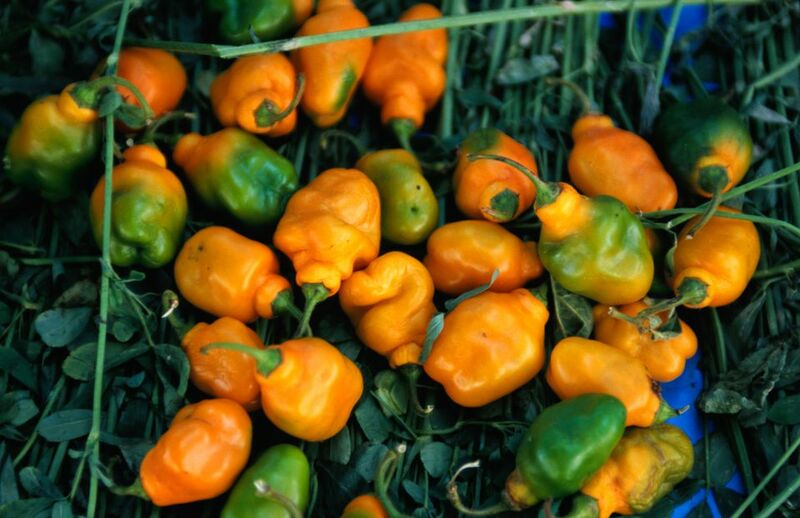 There's more to a habanero than just the magnitude of the heat. Habaneros have their own unique heat profile as well. The heat from habanero peppers comes on more slowly than other peppers, and it lingers longer. It's common, but incorrect, to say "habañero," pronouncing the "n" like the "ñ" in "jalapeño." But the "n" in "habanero" is pronounced the normal way.